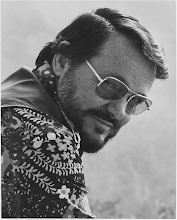 In addition to his own novel, Patron of the Arts, based on his Nebula and Hugo finalist novelette, and his Zandra trilogy, William Rotsler wrote a number of books based on motion pictures and television shows, including Iron Man, Planet of the Apes, Futureworld, and Star Trek. In this 3-part series, we take a look at books set in the Star Trek universe. 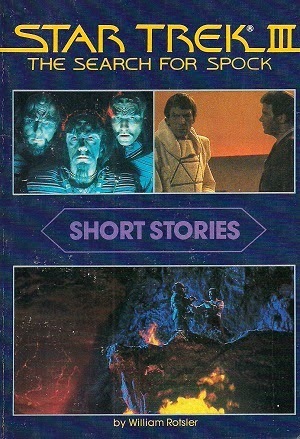 The first part focuses on the two books of short stories he authored, one set in the universe of Wrath of Khan and the other in the universe of The Search for Spock. Below are the original blurbs and contents pages of each book. 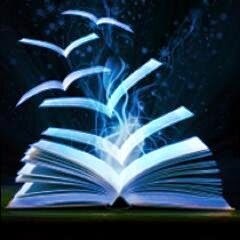 Travel with your favorite Star Trek II characters into six new and original short stories written especially for you! Join James T. Kirk in "The Blaze of Glory" as he struggles to avoid galactic war with the Klingon Captain Kang. In "Under Twin Moons" Lieutenant Uhura finds an unusual way to relax from starship duty. In "Wild Card" an unknown enemy threatens the very existence of the Enterprise and its crew. In "The Secret Empire" incredible creatures struggle for their freedom over slavery; while in "Intelligence Test" Chekov fights for his life. And join the entire crew in "To Wherever" -- a place from which they may never return. 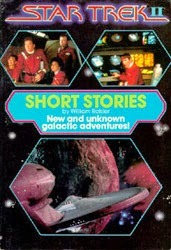 A treasure trove of adventure for all Star Trek fans! Travel with your favorite Star Trek III characters into five new and original short stories. Join the Enterprise crew as they take their crippled starship into orbit around Azphari, where they meet the strange and dangerously curious people of that planet in "The Azphari Enigma." Go with Lieutenant Commander Uhura to her home in the United States of Africa where she finds her past and present colliding in a life-and-death struggle in "The Jungles of Memory." And on the drab and frozen planet of Osler, meet 7-year-old Pandora, sole survivor of an experiment gone wrong, a child with powers and the willingness to use them to protect her privacy and the secret she must hide in "As Old As Forever." These stories and more will thrill and enthrall all Star Trek fans! And watch for the new edition of WILLIAM ROTSLER'S own science fiction novel PATRON OF THE ARTS, coming this Fall from Digital Parchment Services' Strange Particle Press, distributed by FuturesPast Editions.